A new update for the Display Advertising tool is now available: meet Advanced Filters, which will make searching for ads easier. You can find the new filters in the ‘Publishers’ tab, and they’re available for all devices. You can now search through publishers, text ads and landings. 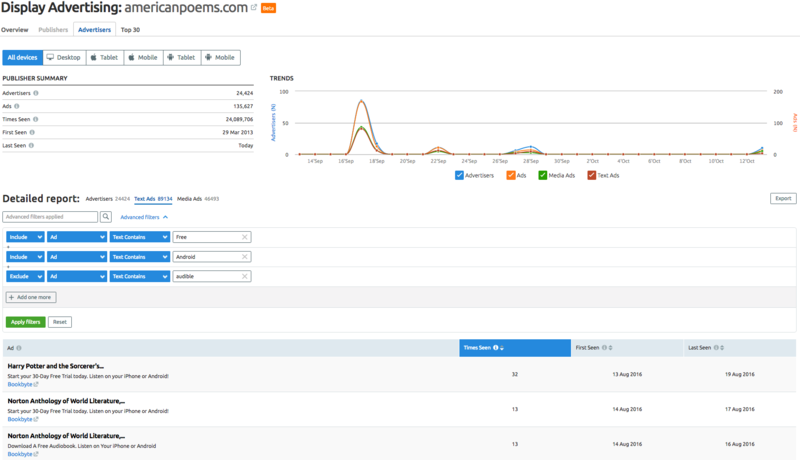 You’ll also find new filters in the ‘Advertisers’, ‘Publishers’, ‘Landings’, and ‘Cross’ reports. And there's more to come. Stay tuned for more updates. As always, we’re looking forward to receiving your feedback. Feel free to send it to [email protected]. Try the refreshed Display Advertising tool right now!